Now entering its 22nd year, the Haitian Summer Institute is a six-week program designed for anyone interested in acquiring basic conversational proficiency in Haitian Creole and also for those students who wish to continue their Haitian Creole Language training at the intermediate and advanced levels. The FLAS-approved institute is held at FIU's Modesto Maidique Campus in Miami and culminates with an optional study abroad to Haiti, which provides participants with a unique opportunity to further immerse themselves in Haitian Creole while experiencing the country first-hand. The optional study abroad to Haiti is contingent upon current U.S. Department of State travel advisories. The program begins with intensive Haitian Creole language training in Miami which is divided into two tracks. Students participating in the Miami portion have two enrollment options: Accelerated Beginning Haitian Creole for the first half of the Miami portion and Accelerated Intermediate Haitian Creole for the final half of the Miami portion, or Accelerated Intermediate Haitian Creole for the first half of the Miami portion and Accelerated Advanced Haitian Creole for the final half. In addition to the Institute's intensive language courses, participants are encouraged to take advantage of their time in Miami and explore Haitian history and culture through various public programs such as lectures by nationally-recognized Haitianists and Diasporic leaders, film screenings, concerts, technical training sessions and events in Miami's Little Haiti neighborhood. Classes in Miami are held Monday through Friday and include a morning and afternoon session. Housing is available on campus at an additional cost. The Miami portion of the Haitian Summer Institute is open to students from all levels, as well as non-traditional students and professionals. The study abroad is designed to further expose students to Haiti, its culture and its people through a highly-structured two-week trip to Haiti. It may include time in the capital city of Port-au-Prince, as well as other areas of the country. Participation in the Study Abroad is optional and space is limited; priority is given to graduate and undergraduate FLAS Fellows and degree-seeking graduate students, although undergraduates, professionals, and non-traditional students are encouraged to apply. The 2019 Haitian Summer Institute program will not include the Haiti study abroad portion due to the current U.S. Department of State travel advisory for Haiti. All applicants are encouraged to submit the application packet, along with the required supporting materials to the Kimberly Green Latin American and Caribbean Center by 5:00pm on May 3, 2019 (Applications may be accepted after May 3, 2019, but space is not guaranteed). *Optional on-campus housing based on double-occupancy during Miami portion. Housing deposit (non-refundable) - $200.00 due on or before May 3, 2019 (made payable to FIU by bank check or money order, credit cards are also accepted). Submit deposit to HSI- Kimberly Green Latin American and Caribbean Center, 11200 S.W. 8th St, DM 353, Miami, Florida 33199. Please contact Viroselie Caviedes (vcaviede@fiu.edu) for information on credit card payment option. Remaining balance (non-refundable) - due on or before May 31, 2019 (made payable to FIU by bank check or money order, credit cards are also accepted). Submit deposit to HSI-Kimberly Green Latin American and Caribbean Center, 11200 S.W. 8th St, DM 353, Miami, Florida 33199. Please contact Viroselie Caviedes (vcaviede@fiu.edu) for information on credit card payment option. Budget Breakdown: $2,111.53 tuition & fees + $2,500.00 stipend. FIU Housing will be deducted from stipend for students choosing to stay on campus. The Haitian Summer Institute fulfills 5 out of 20 points required for the Global Learning Medallion Activity requirement. Based on its assessment of in-country conditions leading up to the Institute, FIU LACC retains the right to suspend the study abroad to Haiti at any time. In the event that unpredictable conditions in Haiti prevent the group from traveling to the country, LACC's FLAS-approved contingency plan will be implemented. More specifically, the Haitian Summer Institute will extend the Miami-based portion of the Institute and its faculty will continue to offer intensive Haitian Creole language training at Florida International University. Both instructors will follow an extended pre-approved syllabus that consists of intensive language instruction Monday-Friday for 5 hours/day for the remaining two weeks of the six-week Institute. FIU Housing contracts will also be extended for an additional two weeks and students will be charged accordingly. Any financial savings that are not reallocated to cover unanticipated expenses due to any decision to suspend travel to Haiti may result in refunds being processed by FIU, based on initial program payment method. 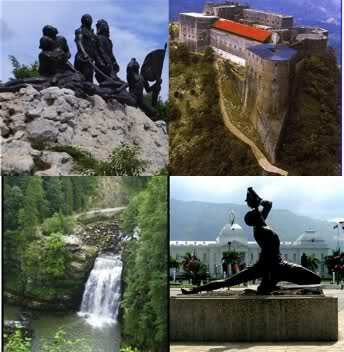 View full Haitian Summer Institute Study Abroad Suspension Contingency Plan here.